Legendary MLB coach Tommy Lasorda recently gave an inspirational talk to El Toro baseball players, their families and fans in early February to serve as a fundraiser for the baseball program at El Toro High School. Lasorda who is almost in his ninth decade of life had a lot of words of wisdom to share with the audience and put an emphasis on the fact that kids can be anything that they want to do as long as they are willing to work. He also talked to the parents present about how to be there as a support system for their children and provide them the encouragement that they need to be successful in no matter what they do. After his speech, the former MLB great stuck around to take part in a question-and-answer section for those who were in attendance. 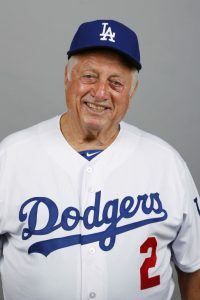 Lasorda recently attended a fundraiser to promote the sports program at El Toro High School earlier this month and gave a great keynote speech that motivated everyone in the room. He also answered questions, took photos, signed autographs, and spent some quality time with his fans. If your company is interested in finding out availability and booking fees for a former MLB manager like Tommy Lasorda or other celebrities for a Book Signing, Charity Event, Baseball Camp, or Personal Appearance, call us at 1-888-246-7141.